Basil Ede was born in Surrey. He was very much influenced by Thorburn and in his early days as an artist followed Thorburn in his use of watercolour and bodycolour on tinted paper. Unlike Thorburn, however, Ede travelled extensively. As a pursar with the Orient Steam Navigation Company he became entranced by the Far East and his frequent visits to Japan and China led him to study the birds and the artistic tradition of the East. 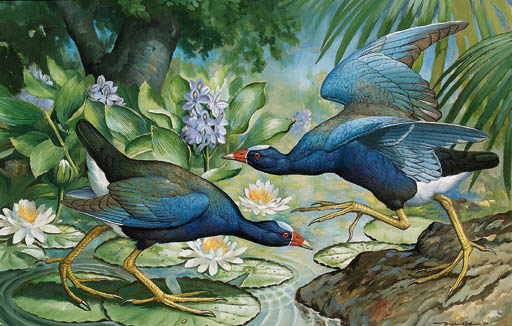 Ede has also travelled for over 14 years in the United States of America, fulfilling a commission for the Warner Collection, to portray all the birds of America. Ede has exhibited in Britain and America and enjoys the patronage of a number of distinguished collectors including H.R.H. The Duke of Edinburgh and has published a number of books. A serious stroke in 1989 led to a change of direction in Ede's work, and he now paints entirely in oil.